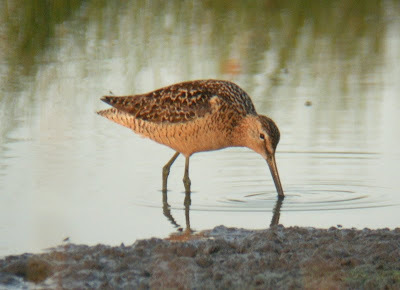 Long-billed Dowitchers are somewhat of a treat in Michigan at any place and any time. 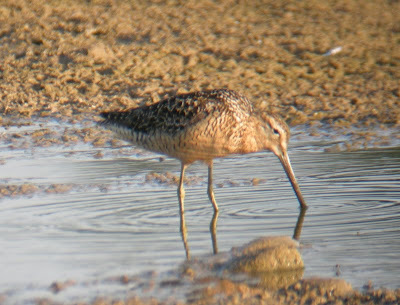 Probably the most common way to accomplish seeing one is to look for late July or August adults at Pointe Mouillee, where adults often (but not annually) arrive and linger as they molt their flight feathers (indeed, the focus of adult Long-billed's lives this time of year is to locate suitably predictable, large mudflats where they can count on habitat being present throughout the late summer period so they can molt) . 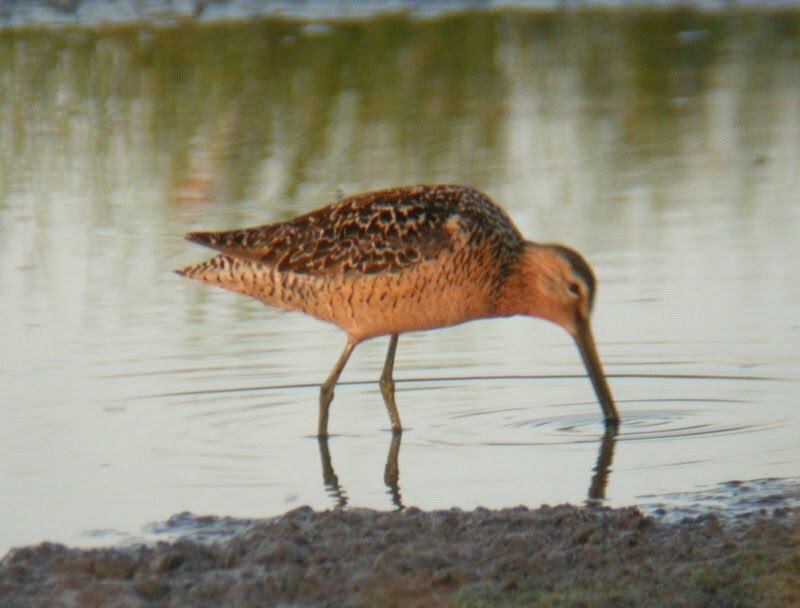 Juveniles, which first show up this far south in early September, are uncommon to rare, but occur most years at scattered sewage lagoons and mudflats throughout the state, and can be chased pretty reliably most years. But seeing a spring migrant anywhere is more notable (I've done it twice for Michigan, 12 May 2007 and 19 April 2009 at Muskegon Wastewater), as most seem to overfly us as they rush north to their NW Alaskan and Russian breeding grounds. Another relatively rare category is the July adult, at least away from the larger coastal wetlands such as Nayanquing Point and Pointe Mouillee. Presumably, they are tougher to find at small, inland wetlands because they are actively seeking only the larger wetlands for flight feather molt, and overflying all other habitats. Such birds are not likely to stop for very long at any other sites while en route to the molting locations, since they are such strong fliers and can go straight to the preferred sites. So not surprisingly, the first time I have ever seen a summer adult away from Mouillee was yesterday at the Caledonia Sewage Lagoons. I had been hoping to add Short-billed Dowitcher to my Kent Co. list and thus was happy to notice a single dowitcher as we (Curtis Dykstra and I) arrived. 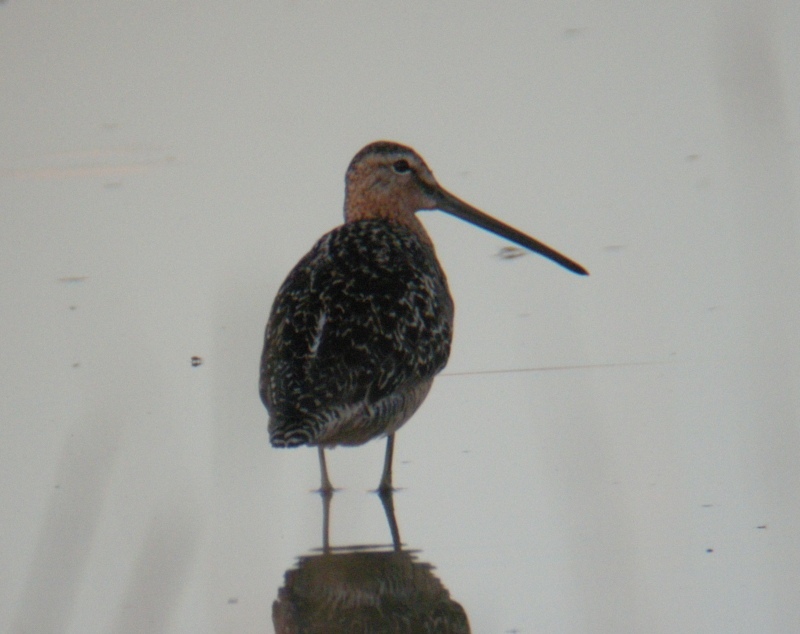 I assumed that since something like 99 out of 100 Michigan dowitchers are Short-billeds that that was what I had. However, despite my efforts I could not make it such. First off, voice was clinching: the bird always gave single, repeated, and well-spaced "keek" notes, each a high pitched whistle (at roughly 9, 13, 14, and 15 seconds into the clip). 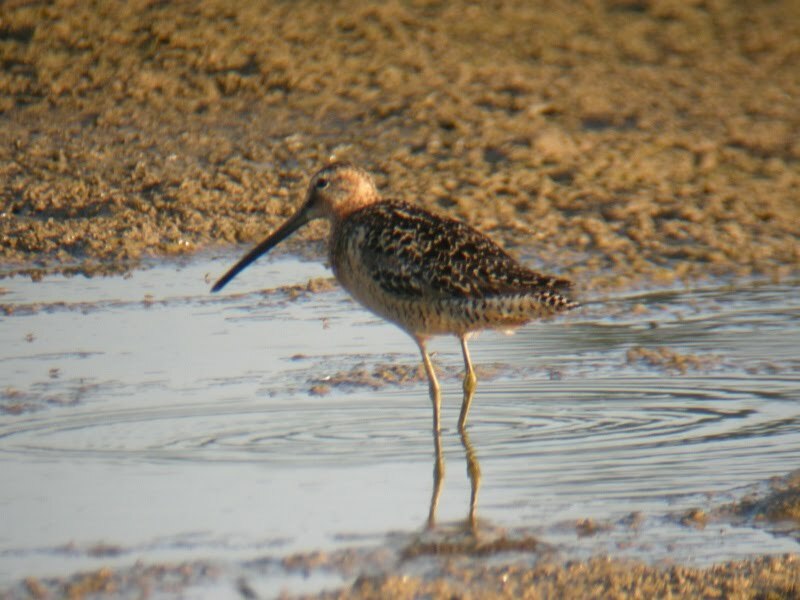 On a couple occasions, as it flushed and flew around with 100+ Killdeer and 10 Lesser Yellowlegs, I heard other variations: once it gave a 2 noted "Kek kek"(exactly matching the note at 0:05 into the Stokes eastern track for this species), and once a flustered burst of similar notes, not at all like the clear "tu-tu-tu" notes of Short-billed Dowitcher. 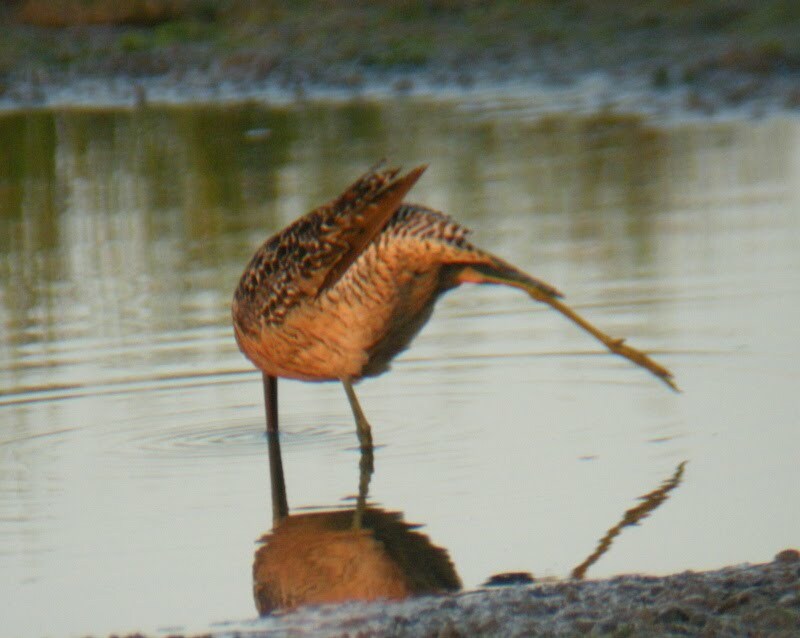 Both of these variations are acceptable for Long-billed Dowitchers. Now to plumage and structure. The bird was long-billed (making it a female, which is also parsimonious since females leave the breeding grounds before males, as soon as the chicks emerge), and long-legged, with a tall, arching back and the "swallowed a grapefruit" body that Kevin Karlson et al. have made famous. Its upperparts were relatively dark, though not as dark as many other specimens and wild birds I've seen. Its underparts displayed the classic Long-billed condition: horizontal, thin, bars on the tips of the lateral breast feathers, moderate spotting across the middle of the lower neck/upper breast, and no markings at all on the middle of the lower breast and belly. The tail was rarely visible (the predominant feather tract showing here is actually the uppertail coverts, not the rectrices themselves). But if you look carefully just beyond the end of the uppertail coverts you can see the tops of the middle rectrices, and that they have wide black bars and thin white ones. This trait is supportive, not diagnostic, as confirmed by my own specimen review and the literature. The tail is visible here, slightly, as well, and you can also get a good feel for the bill shape, which Karlson et al (the Shorebird Guide) use to separate the dowitchers but I am still working out. Finally, it is worth noting that this bird was NOT missing any flight feathers. 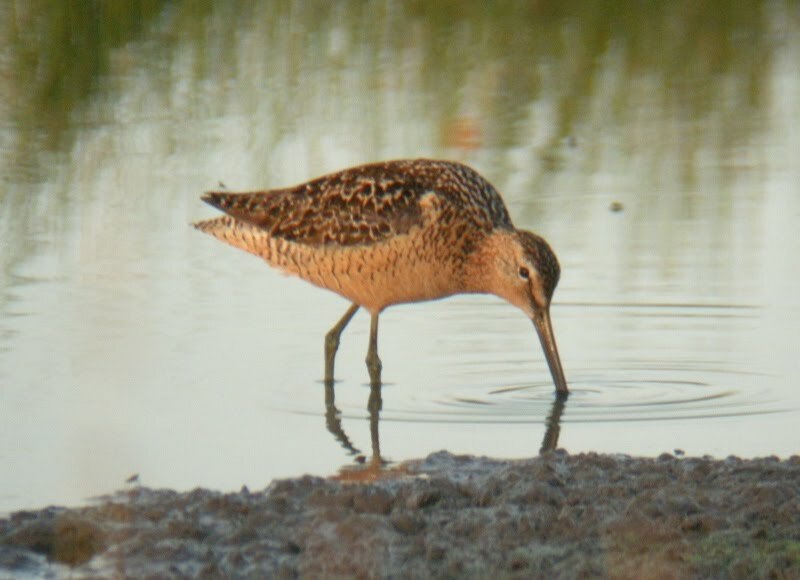 This is not surprising, because these birds are molt migrants, who select out a very small percentage of the wetlands on the landscape for molt, in Michigan including only Nayanquing Point (formerly) and Pointe Mouillee (formerly and currently). Other than that, molting sites in the eastern US are rare, limited mainly to Ottawa NWR and surrounding wetlands in NW Ohio, and Bombay Hook DE. The fact that this bird stopped in Michigan at such a small site makes me hypothesize that it is more likely to be of the latter group, otherwise why wouldn't it have just flown the extra 150 miles to get to Ottawa NWR and start molting? In any event, such a bird would not be expected to molt flight feathers as it is actively migrating, which is supported anecdotally by this individual. Very likely, once it arrives at its molting destination in another few days to week, it will immediately drop its innermost 3-6 primaries. This is a sick bird for Kent County. Seems likely that it could be the first well-documented county record. Just saw one a juvenile one today, unfortunately deceased, outside the Old County Building in Mt. Clemens, Mi.